Will You Be Healed Today? Do you have something that is troubling you? Are you willing to move forward and be free? How are you feeling right now? Give yourself a score from 1 to 10, where 1 is the lowest (sad, depressed, guilty, angry, frustrated etc) and 10 is the highest (happy, buoyant, fun, joyous etc). If you are not feeling good at the moment, you might like to do this meditation and receive Karuna Reiki and healing over the net. Click on the audio file below as you read my instructions. It will help. Put your hands on your screen on top of mine below and relax for a few minutes. Allow your mind to be open to Universal Healing. Allow your mind to relax and just feel the energy inside and around you. Breathe deeply and imagine your mind is letting go of control and you are sinking further down into your body. 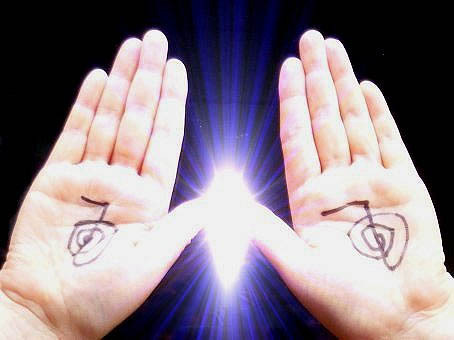 Become aware of your hands on top of mine and allow the healing forces of the Universe to enter. I am radiating Universal Love and Light to you now to salve your wounds and ease your pain. You may feel light tingling sensations in your body or become aware of sounds and/or colours. If you shed a few tears, that is fine, allow your emotions to surface without judgement. It’s ok to feel whatever you feel. Continue to breathe gently and know there are now Angels here protecting and guiding you. You are safe in this moment. Imagine you can now see a great Light in the distance and your own personal Guardian Angel is now walking towards you. As your Guardian Angel approaches you, you notice a gift which is now being given to you. Take note of this gift. What colour is it? What does it look like? Does it have a name? It is now yours for all time. Continue to breathe as you see your Guardian Angel turns around and walks back into the Universal Light. Wave goodbye and offer thanks as your Guardian Angel returns to the heavenly realms. Become aware of your body and any physical sensations. Breathing gently, bring your awareness back to your hands on top of mine. Write down your healing hands meditation experience. Focus on what you received and what you felt. Did you feel anything? Did you see anything? How do you feel now, give yourself a score from 1 to 10. Did your score change? Go up or down? Continue to pay particular attention to how you feel and take note of your dreams over the next few days, you might get another visit from your Guardian Angel! Start a healing journal and write down your thoughts and feelings every day. You deserve to be listened to, especially when it’s you listening to you! You might find it easier rather than putting your hands on your computer screen, to print this page out and put your hands directly onto the printout (it will still work). You can do this meditation at any time, but best not to if you are driving! Whenever you feel down, return to this meditation. Brightest Blessings and I hope you feel better! * Background music courtesy of www.orindaben.com and is called Angels of Beauty.